Portugal and Serbia have dominated the U16 European Championship in Matosinhos. On day 10 they picked up the biggest prize by winning promotion to Division A.
Ticha Penicheiro, Portugal's most famous basketball player, was in attendance. He witnessed a historical moment for the U16 programme with their first ever promotion to Division A when Portugal rolled over Finland in the second semi-final (71-47). The game was close for 15 minutes with Portugal holding the advantage (18-17). Ana Neves, the coach from Portugal, then changed her offensive options. The result was immediate. Portugal scored 11 unanswered points and took control of the game for good (29-17) with 19 minutes played. Finland never recovered. With 2500 supporters also against them the task for them was impossible. 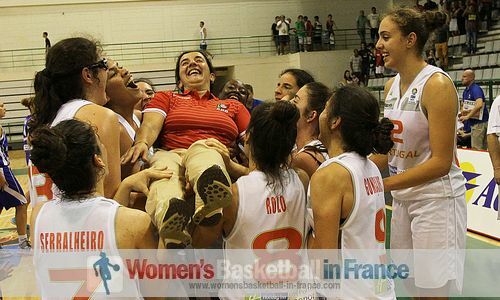 Carolina Goncalves (14 points) and Maria Kostourkova (13 points, 17 rebounds) were once again the leading players for Portugal. Sofia De Almeida and Maianca Umabano also contributed double digits scores with 12 and 10 points each. 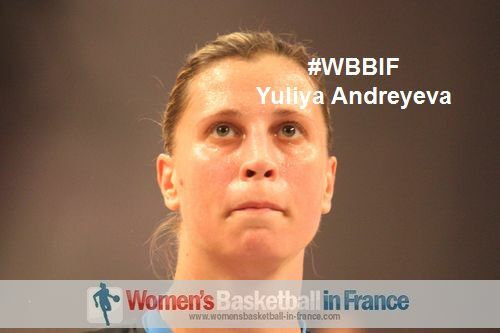 Serbia earned their return to Division A, earlier in the day with a comfortable victory over Finland (77-46). Serbia scored the first 10 points of the game and never looked back. Jovana Nogic led the way with 18 points and 5 assists. Her team-mate Jovana Subasic filled the stat sheets with 12 rebounds, 4 assists, 4 steals and 6 points. Serbia and Portugal meet in the U16 Division B European Championship game to determine who will go home with the winner's trophy. Whereas Finland and Denmark will fight for bronze and the last promotion place. In the other matches Israel beat England (62-50) and Poland edged out Belarus (65-63) in the 5th - 8th place classification round. Luxembourg were yet again involved in a cliff hanger. They allowed a 27-point lead shrink to 1 point with a minute to play. However overtime was not required as they held on to beat Slovenia (63-60). 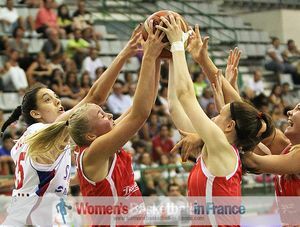 Lisa Jablonowski finished her tournament with a doubled-double for Luxembourg with 20 points and 15 rebounds. Germany were involved in a 4th quarter shoot-out with Switzerland 22-22 but still won the game (65-52) while Estonia won their first game of the competition (51-41) against Norway.